Michigan Central Station, a hulking ruin, is a 230-foot-tall symbol of urban decline a stone's throw away from Downtown Detroit. Now, though, Ford Motor Company is in talks to buy the abandoned station from its owners, the Moroun family. 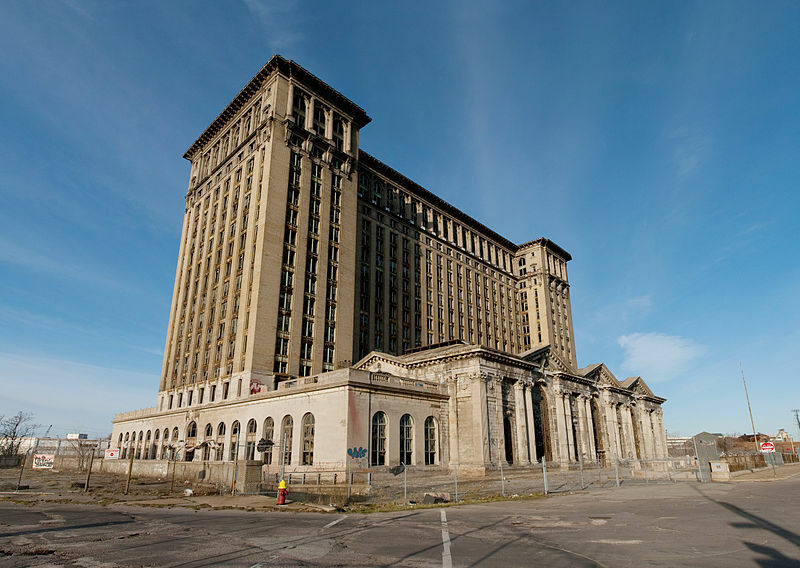 As soon as April, the Dearborn, Michigan–based automaker could ink a deal that would transform the 500,000-square-foot train station in the city's Corktown neighborhood into—well, it's not really clear at this time. In the past, Ford leadership said that expanding their workforce in Detroit, historically a home base for the company, is part of a strategy to attract and retain younger talent, many of whom want to live in cities. 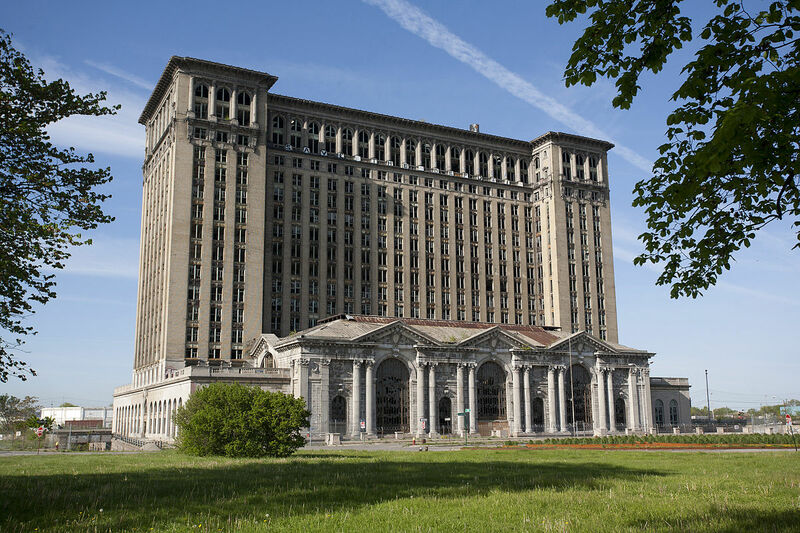 The news comes as Ford is moving around 200 workers to a facility down the street; those familiar with the just-announced deal say 1,000 or more workers could fit inside a transformed Michigan Central Station. "At this time, Ford is focused on locating our autonomous vehicle and electric vehicle business and strategy teams, including Team Edison, to The Factory in Detroit’s historic Corktown neighborhood," Ford spokesman Said Deep told Crain's, which first reported the story. "While we anticipate our presence over time will grow as our (autonomous/electric vehicle) teams begin moving downtown in May, we have nothing further to announce at this time." 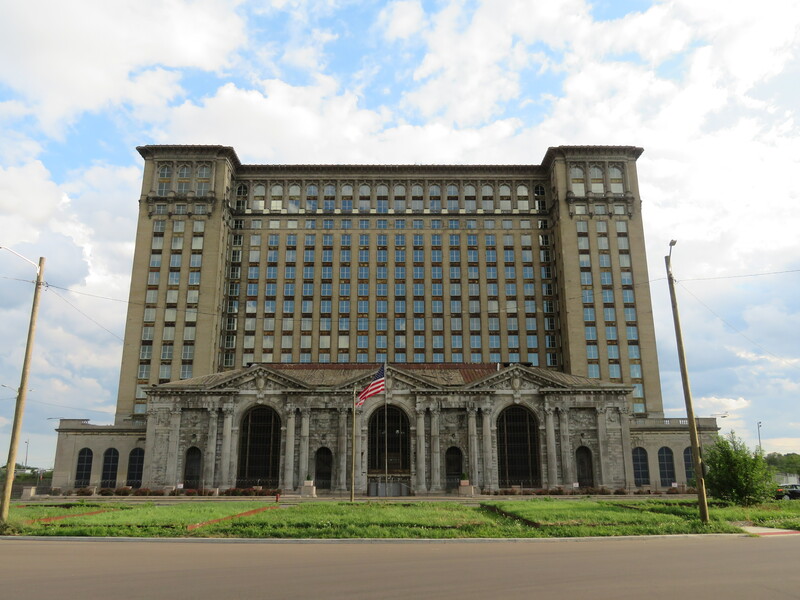 Amtrak stopped running trains through the station in 1988, and since then, the Michigan Avenue building has served as a low-hanging symbol of Detroit's deindustrialization. Alongside countless ruins tourists on Flickr, artists like Camilo José Vergara and Andrew Moore have extensively documented the decline of the station and the surrounding city. Recently, though, the Moroun family has brought the space back to life, somewhat. Last summer, they opened the building to a Crain's-produced event for investors interested in the city, and they've spent $8 million on window replacement and structural upgrades in the past three years. If Ford drives the station deal home, it would not be the automaker's only major investment in its Michigan physical assets. Ford is in the midst of a ten-year, $1.2-billion overhaul of its neighboring Dearborn campus, with the help of architects at SmithGroupJJR. It isn’t just the Michigan Central Station that is being eyed for redevelopment. Spread out before the domineering structure is what was once an ornate manicured garden known as Roosevelt Park. Designers and community members are hoping to transform the scruffy patch of green, which marks the intersection of Detroit's Corktown and Mexicantown neighborhoods, into a public asset. A direct result of the City Beautiful Movement at the turn of the 20th century, Roosevelt Park was originally designed by Daniel H. Burnham and Edward H. Bennett. The park was specifically crafted to work with Judge Augustus B. Woodward's original plan for Detroit, which called for broad green boulevards and numerous public parks. This park was meant to be a grand welcoming space for the local community and those arriving to the city by train. The current project is being led by San Francisco–based Assembly Design Studio and Detroit-based community research consultants Human Scale Studio. Through a series of meetings with city officials and community workshops, the park's design now has three distinct paths forward in the form of three conceptual proposals. Each proposal addresses the concerns of the city and the community while focusing on a different theme and spatial arrangement. The first of the proposals holds closest to the original park while working to improve access and safety. Currently, the park is a traffic island, inaccessible except across multiple lanes of traffic. This plan calls for the removal of some roads that travel through the park while improving crosswalks, parking, and bike lanes around its perimeter. The second proposal responds to the greater city grid with changes to the surrounding and on-site roads. New pedestrian and bike-only paths would be added to the park, which is divided by several roadways. New sports fields, hardscapes, and softscapes would reflect back to the park’s original form and relationship to the train station. The final proposal is by far the most drastic of the three. 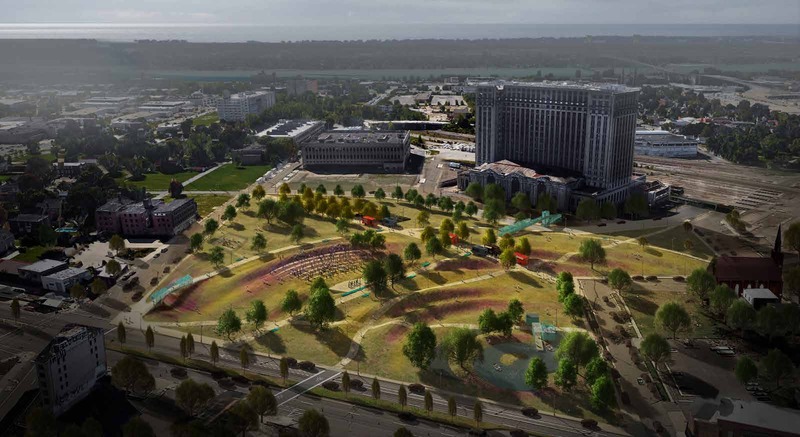 Unified into a single large park space, the plan calls for large landscaped ripples emanating from the northwest corner of the park. Areas for food trucks and an area for a farmer’s market will provide food options, while an area for special events and an amphitheater will bring entertainment programming to the park. A formal gateway is also part of the proposal, as well as sports field and playgrounds. While these may not be the first new proposals for the oft overlooked park, they may have the best chance of succeeding. (In 2009 and 2010 two other groups began the process of bringing the park back to life.) With a “green light” from the City of Detroit, these current proposals also have support from business leaders and community members in Corktown and Mexicantown. While trains may not be returning to the area anytime soon, with a little love, people may find a reason to come back to Roosevelt Park. 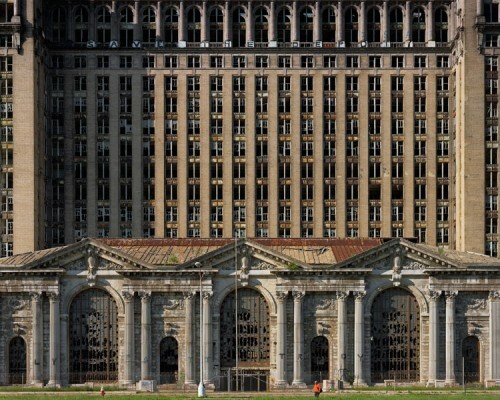 No building has been used to represent the decline of Detroit more than the Michigan Central Station. Towering over the Corktown neighborhood just south of the city’s downtown, the once bustling train station has lain vacant since the last train pulled away in January 1988. Today the building’s owners, the Moroun family of companies, is hoping the iconic building can become the symbol of the city’s renaissance. For the first time in decades, a private event will be held in the vacant building. Slated for later this summer and produced by Crain’s Detroit Business, the fourth annual Detroit Homecoming is an event which brings back Detroit “expats” in a bid to bring investment into the city. The event will take over three days, starting on September 13th, and will bring together hundreds of former Detroiters and local business investors. The opening dinner will take place in the grand 53-foot-tall lobby. Tours up to the 13th floor will allow guests to look out over Detroit. Opened in 1913, and listed on the National Register of Historic Places since 1975, the building has had brushes with restoration as well as demolition over the years. In the mid-2000s the city moved to demolish the building, which led to a lawsuit to protect the building. Designed by Warren & Wetmore and Reed & Stem, the 230-foot-tall Beaux Arts tower was once the tallest train station in the world. At one point, over 200 trains passed through the station every day and 3,000 office workers worked in the 500,000-square-foot building. In recent years, restoration has begun on the building. According to the Moroun’s, over $8 million has been spent on asbestos abatement, vandalism cleanup, initial interior work, and other early-stage renovations. Most visible of the changes to the building was the installation of 1,100 new windows in 2015. It is estimated that to complete the restoration will cost over $100 million. And though work has begun, no official word has been given on what the station may become. In the past, ideas have been floated including a convention center, a casino, Michigan State Police headquarters, and Detroit Police headquarters.